Louis Daguerre is generally credited with creating the first photograph. However, this is not entirely true. Daguerre was actually, the first to patent a photographic process that he had improved based on the earlier work of his partner, Nicephore Niepce. The French government even bought Daguerre's patent and then released it publicly as a gift "Free to the World." There were others who claimed that they had created earlier images, but just hadn't patented their processes. 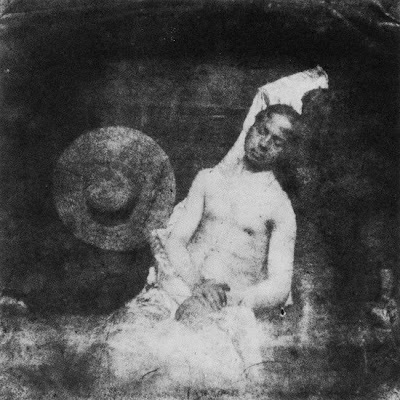 The most famous of these early photographers was Hippolyte Bayard who had created a process known as direct positive printing and had even held the first public exhibition of photographs. The corpse which you see here is that of M. Bayard, inventor of the process that has just been shown to you. As far as I know this indefatigable experimenter has been occupied for about three years with his discovery. The Government which has been only too generous to Monsieur Daguerre, has said it can do nothing for Monsieur Bayard, and the poor wretch has drowned himself. Oh the vagaries of human life....! ... He has been at the morgue for several days, and no-one has recognized or claimed him. Ladies and gentlemen, you'd better pass along for fear of offending your sense of smell, for as you can observe, the face and hands of the gentleman are beginning to decay. Bayard was very much alive continued to photograph for years to come. Who says artists haven't always been dramatic? Bummer. It reminds me of Elisha Gray. I wonder what he has done to get rid of his frustration (make the first prank call? ).